Following the closure of the Mediterranean to Allied merchant vessels in June, 1940 when Italy entered the war and the consequent loss of the Suez Canal, Freetown in Sierra Leone became the staging post for vessels destined for Australasia, Asia and the Gulf before taking the long haul round the Cape of Good Hope and for returning vessels destined for Africa, America and the UK. 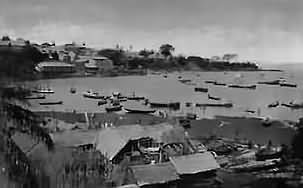 Freetown had the best harbour on the West coast of Africa but, since it was surrounded by malarial mangrove swamps, it was known also as 'the white man's grave'. However, during the course of the war it was placed under the control of the Army and became a Naval base serving thirty-two separate convoy routes with facilities for bunkering . Coal was imported from the UK to supply the port and Grangepark (11) and Nicolas (12) in the convoy were carrying Welsh steam coal for this purpose. Water, which in spite of the high rainfall was sometimes in short supply, was shipped from the UK in tankers. Freetown was also a base for the Maritime Royal Artillery (MRA), the service that supplied the DEMS gunners aboard merchant vessels. The airstrip in Takoradi on the Gold Coast of West Africa (now Ghana) had been used for passenger and mail services to Khartoum since 1936 but in 1940 the runways and facilities were greatly extended to provide a military supply route to the Middle East. The major commodity was aircraft; Hurricanes, Blenheims and Wellingtons from the UK and Tomahawks from the USA, either complete or in parts that were assembled in Takoradi. The aircraft were then flown to Khartoum or Abu Sueir - a journey of more than 3,500 miles which took six days to complete. In OS.33, Belgium Seaman (42) carried cement and aeroplanes to Takoradi while Ashantian (22), New Texas (71), Maloja (33) and New Toronto (31) carried RAF or government stores.